With Valentine’s Day just around the corner, you might be wondering what the world’s favorite matchmaker is up to. 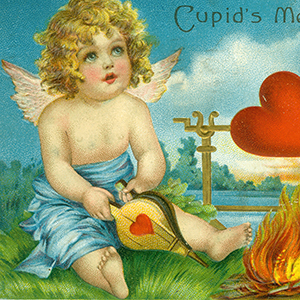 Always on the lookout for the latest trends in matchmaking, Cupid reads a lot about what makes a good romantic match. Fortunately for us, he’s willing to share his favorite books so that you too can improve your own matchmaking skills. If you prefer to reminisce about some of the greatest marriage matches in European royalty, then Cupid recommends a biography about one of the noblest matchmakers in history. Queen Victoria's Matchmaking tells the true story of how the British queen arranged the marriages of her 42 grandchildren to extend her influence throughout Europe. And of course Cupid wants lots of perspectives on online dating. The Hypothetical Girl provided him with some much-needed insights. This short story collection explores the ins and outs of online romance from meeting virtually, finding true love, and dealing with feelings of acceptance or rejection. Lastly, Cupid says dating manuals are one of the best sources of wisdom when practicing matchmaking. What better book to guide you than The Jane Austen Rules? Not only will you learn the “rules” of dating, but you’ll also get to spend quality time with some of Jane Austen's most beloved characters. Unsurprisingly, Cupid is a Jane Austen fan, so he also suggests Mr. Darcy's Guide to Courtship. Here you’ll read what Pride and Prejudice's eligible bachelor finds important in wooing a potential mate. Once you’ve read these books, Cupid’s sure you’ll be ready to go on your own matchmaking adventures. What other books would you recommend for would-be matchmakers?